The ability to accept credit card payments is vitally important for most businesses today. That's why Sage Payment Solutions provides a variety of ways to accept and process payments in Sage 300 ERP (formerly "Sage Accpac"). Adhering to strict PCI compliance rules, Sage Payment Solutions provides your business with the freedom to accept credit cards in person, by mail, over the phone, online, or with your mobile device. 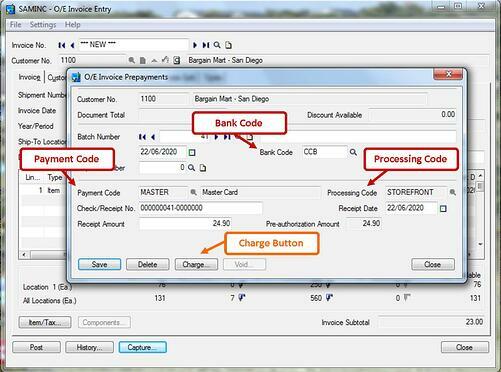 Here's how to process credit card transactions using Sage 300 ERP (Accpac) Payment Processing. Besides having a working internet connection, you must install Sage Exchange on the workstation you are using to process credit cards. Sage Exchange connects your Sage 300 ERP system to Sage Payment Solutions. Sage Exchange transmits and stores credit card details in a PCI-compliant vault, which protects you from exposure to noncompliance penalties and credit card fraud. These may be different from the information in the Sage 300 ERP customer record. For example, the customer may be using a company credit card, or may be authorized to use a card on behalf of the primary cardholder. Note: For some transactions, you can edit the amount in the Taxes field in order to comply with Level 2 processing requirements. When you edit this amount, the amount in the Subtotal field is calculated automatically by subtracting the taxes you entered from the transaction total. The Sage Payment Solutions browser form will appear. Sage Payment Solutions will then process the payment and once it's finished, the browser form will close. The transaction details and a status message will then appear on the PMT Process Credit Card screen. Once you finish reviewing the transaction details and status, click Close. And that is how you process a credit card payment in Sage 300 ERP (Accpac)! In summary, Sage Payment Processing is a complete payment processing solution that allows you to securely accept and process credit card transactions directly within Sage 300 ERP. Learn more about Sage Payment Solutions and how you can reduce your credit card processing fees by 50% or more if you're a current Sage 300 ERP (Accpac) customer. Contact the Sage 300 ERP experts at Equation Technologies for assistance.